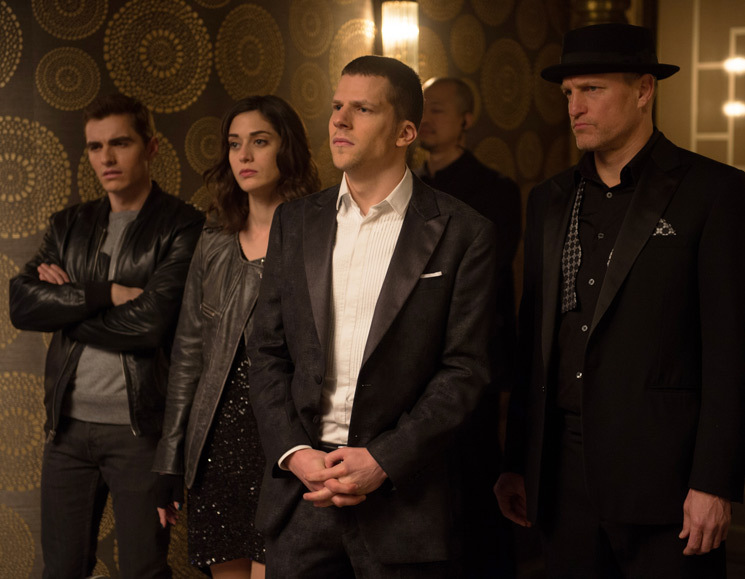 The makers of Now You See Me pulled off quite the move back in 2013 by making a movie about a group of rogue magicians pulling off a heist one of the summer's biggest blockbusters (the film grossed over four times its original budget by year's end). While audiences were receptive, critics were less so, finding faults with various plot inconsistencies come its conclusion (though some were smart enough to deduce a sequel was probably in the works). Like all good magic acts, Now You See Me 2 is the kind of film that requires you to leave some degree of logical thinking at the door. If you can manage that, it will likely be one of the most entertaining cinematic experiences of the year. Directed by Jon M. Chu, the film finds the remaining members of the Four Horsemen — leader J. Daniel Atlas (Jesse Eisenberg), Merritt McKinney (Woody Harrelson), Jack Wilder (Dave Franco) and secret member Dylan Rhodes (Mark Ruffalo) — laying low after their last demonstration. In the public eye, they've become the modern day equivalent to Robin Hood and his band of merry thieves, and, after recruiting a new member to round out their crew (Lula, played by an over-the-top Lizzy Caplan), they decide to make their grand return by revealing a tech company CEO's dastardly plan at his next public appearance. Turns out evil bearded mastermind Walter Mabry (Harry Potter star Daniel Radcliffe in some ingenious casting) has been following them for quite some time, and wants them to pull off their biggest heist yet: steal a special computer circuit known as "the stick" that has the ability to decrypt any program in existence. If they don't, he'll make them disappear for good. Step Up sequels director Chu may seem like a strange fit for what feels like this generation's answer to Ocean's, but Now You See Me 2 moves and flows like a perfectly choreographed performance that makes sure your eye never wanders. Adherents to realism may find the action to be pure fluff, but that's what ultimately makes it special; there's something to be said for a film that delivers unadulterated entertainment — convoluted plot points and all — and it's refreshing to see a story unfold that doesn't take itself too seriously. Say hello to the next big film franchise.